Please contact Rae (rae@luvzhorses.com) for more information about this pet.Hello,My name is Addison, kind of a sophisitaced English name. I like it. I just got here from the Bastrop shelter with my sister Artemis and we were scared out of our wits. I have gotten a lot more comfortable BUT my sister is still more afraid than I am.Foster mom will be keeping us for a week or two more or until we are comfortable being handled and with people but we will be looking for our special forever home the whole time!Let my foster mom know you might want me as your BFF and then come to meet me!! !UPDATE:Wow, time flies when you're having fun. Foster Mom had to be away for 3 months and we did not get much attention while she was gone, but now we're having special 'lessons' in liking people and we're doing quite well. My sister is STILL a big scaredy cat, but Foster Mom and Foster Sister are going to work really hard with her during Christmas vacation so we will be ready for our forever homes soon after. We are both very healthy and beautiful and we are the age shown below here on this page. We will make great BFF's, why not ask about us and take a chance - you won't be sorry!UPDATE Jan 16: We are still VERY skittery and Mom is going to order some Jackson Galaxy flower remedies and we will be moved into large cages so Mom and Sis can work directly with each one of us. Here's hoping - - UPDATE March 13: Happy to say that Addison is doing very well. Still a bit timid, but coming up to be petted and enjoying it. She's out of a cage and lots of the 'roaming' kitties in the house have been allowed into the room where she is and it's now on to the next step - allowing her to come out of the kitty room and into the normal house if she wants. I've changed her status to 'available for adoption' and she is ready for a home that is fairly quiet with someone who is willing to be gentle and patient with her. She's a really SWEET kitty and deserves a chance at a forever home. She gets along with other kitties, so a home with another buddy would be great.UPDATE September 10, 2016: I am sooo ready for love . Addison is finally ready fully for a home. She will take a bit to get used to the new digs, but she's been off with a temp foster for 6 weeks, is back and is asking to be petted, venturing out in the house and has left sister behind in so many ways. She can be picked up, petted and will most of the time come to you. Loud or sudden movements still un-nerve her, but in a normal home setting she'll be a great companion. 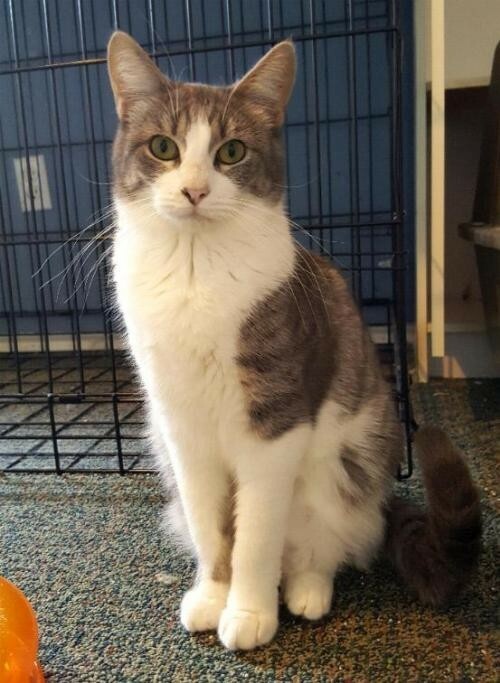 Addison is very healthy and up to date on vaccinations and is spayed and microchipped! Won't you consider HER as your new BFF?UPDATE: October 2018: Hey, I'm back. Had a little health scare but turns out it was a wrong diagnosis and I'm healthy as can be. I've been living in foster mom's bedroom and having a lot of fun and attention. I love to sleep right next to her leg and I love being petted and I even beg to be petted. I am still a little insecure and it shows when you move fast or try to chase or catch me. I'm also a bit face shy still although I love it when you scratch and pet my head, just nervous if you try to use two hands at once. If I'm on the bed and I know you, you can pick me up. I will be okay for a few minutes but after that I want down. I have the tiniest little meow, you'd think I was a kitten. I might be a little bit insecure still BUT once I settle in and get to know you I'll be your BFF and give you back lots of love!New pics coming soon!Visit this organization's web site to see any additional information available about this pet.